A kawaii/gothic blog about fashion from Sooyun Ichtama's point of view in Second Life! 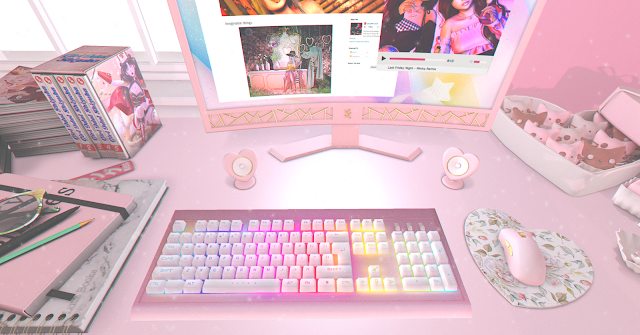 I wish my computer area looked like this to be honest. I don't even have a desk.. but I do have a pink computer. And I do have a light up keyboard too! Though, it isn't pink. This keyboard is by Insomnia Angel! Hope you enjoy all the pinkness today. Don't forget to click on the decor photos to see a larger photo. I am a 28 year old fashion blogger in the virtual world known as Second Life! I have taken up this occupation for the past 5 1/2 years. I enjoy tea, video games, stationery, washi tape, makeup, macarons, sushi, hello kitty/pokemon related items, and cute things.